Julia & Mauricio’s September 15th wedding was the perfect mix of traditional and out of the box. The fun began the minute the party bus dropped everyone off at the venue and didn’t end till it picked them back up for the after party. The couple’s dog served as ring bearer (and looked adorable in his little tux) and the groom’s heritage was represented by the Peruvian band that played during cocktail hour. The ring bearers looked handsome in their traditional outfits while the flower girls looked beautiful in their white dresses. The newlyweds choose a cool way to display their seating assignment cards. They purchased post cards from around Santa Cruz County and placed everyones names and tables on the back. It made for a fun and color display in the grape arbor! The bride and groom made a gorgeous pair! The bride especially looked stunning in her simple but beautiful gown. The most talked about part of the night was when the bride and groom serenaded their guests with a song they had specially written for the event. It was a really wonderful and touching moment and great fun for the guests! The weather on Saturday, Sept. 8th was about as perfect as you could get. Sunny with a brilliant blue sky but not too hot. Rancho Soquel looked gorgeous and the arch that the groom’s Dad built fit right in so well that we wanted to keep it. But no, it will go to the couple’s new back yard. We had the addition of those fabulous crossback chairs and farm tables from Viewpoint Events to add to the setting…gorgeous! As if the setting weren’t enough, Jenna and her parents looked stunning and extremely happy with their day! 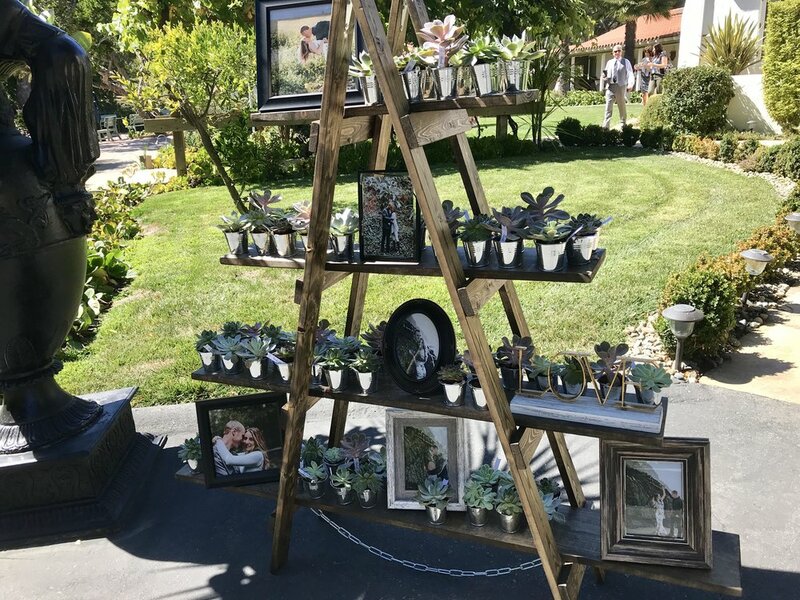 A ladder of succulents were the guest’s favors and a special touch was an engraved Nuernberg Toasting Cup, gifted to the bride and groom. Gorgeous Day, lovely party! Arria & Curtis' August 25th wedding at Rancho Soquel was nothing short of spectacular! Lots of personal touches and beautiful details made this day even more wonderful for this sweet couple! The decor, provided by View Point Events and Eventscapes, really added something special to the already amazing landscape of Rancho Soquel! The bride put a lot of thought into the look of her big day and the results were gorgeous! There were couches and chandeliers everywhere and Eventscapes built an amazing wall backdrop of greenery for the cocktail area. Pops of color were added throughout the event from the stunning flowers, beautifully hand crafted by Susis' Flowers, and lovely tablecloths from La Tavola Linens. Pretty blushes, rich reds and sparkly golds filled out the palate of the day. Personal touches were sprinkled in every corner of the venue. A memory table gave tribute to loved ones who couldn't share in the day but were never far from the newlyweds minds. The bride's step-father hand built their fantastic corn hole. Persian (part of the bride's ancestry) cookies were served alongside Buttercup Cakes' desserts. You could feel both families thoroughly represented throughout the day! Everything turned out beautiful, but nothing compared to the stunning bride! Arria looked absolutely breathtaking in her gown, while her new husband looked very handsome in his blue suit. They looked even more the perfect pair by the smiles that never left their faces all day! Grandma and Grandpa steal the show! What a gorgeous couple! The dress was stunning as well as the entire bridal party! Saturday's wedding was just beautiful! Not only was the weather perfect but each of the 9 attendants were cuter than the next. It's not often that a large bridal party like this one goes off without a hitch, but everyone of the bridal party, even the guys, were in it for the greater good. What a fun group! Saturday's wedding was just beautiful! Not only was the weather perfect but each of the 9 attendants were cuter than the next. It's not often that a large bridal party like this one goes off without a hitch, but everyone of the bridal party, even the guys, were in it for the greater good. What a fun group! Seed Packets served as the seating assignments and everyone made a stop by the Memory table, including the bride and groom. But the hit of the day was Grandma and Grandpa serving as Flower Girl and Ring bearer and dancing down the aisle to Frank Sinatra! Delicious Buffet from Feast for a King Catering followed by platters of cookies from the Pacific Cookie Company and the ice creme cart provided by Sweet Surf. Fun fact is that the brides great grandparents had an ice creme shop and the love of ice creme in this family was even included in the ceremony. Seems the groom won her over with ice creme! DJ Jeffty had the party going non stop until the send-off. Great wedding! August Wedding at Rancho Soquel! Celeste & Gavin's August 4th wedding at Rancho Soquel was filled with family, friends and good times! The bride looked absolutely stunning in her sparkly dress with incredible details in the back! She looked picture perfect walking down the aisle to her groom! Tarnish and Bloom provided stunning floral displays from the greenery draped over the arch to the colorful blooms adorning the tables! Buttercup Cake did an amazing job on the beautiful cake, which the kids eagerly anticipated eating, they were first in line! The favors were bottles of homemade wine made by the bride's family! We enjoyed coordinating this wedding so much and wish these newlyweds a lifetime of love!